Rogness Brewing Company from Austin, TX again has impressed me with another beer. This time with Belfort, a Belgian-Style Strong Ale. 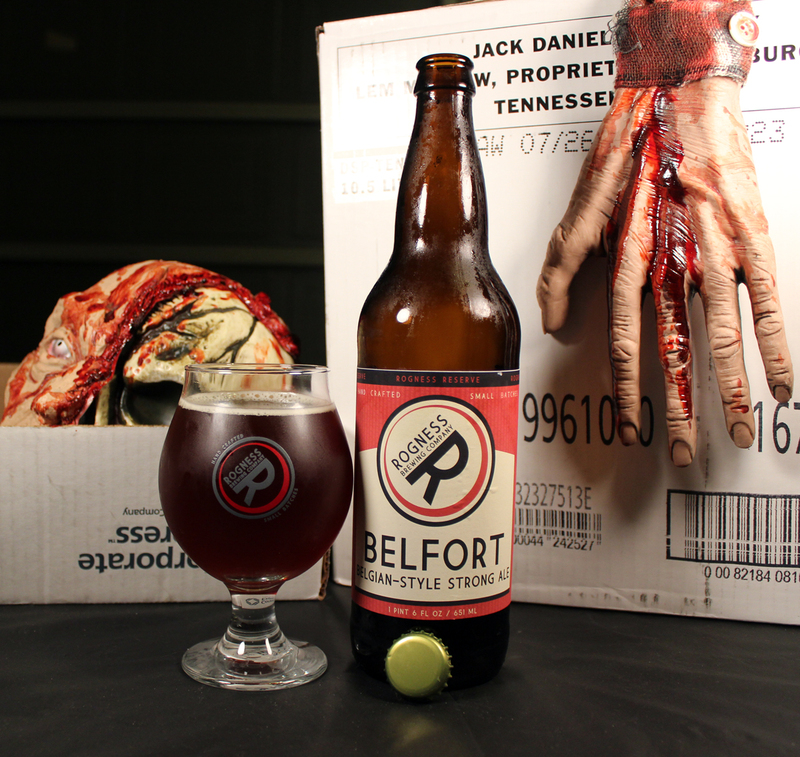 The name Belfort was put together with Bel meaning Belgian, and Fort actually meaning Strong in French. I had heard great things about this beer, and some people I know actually say this is their favorite Rogness beer, so coming into this beer for review had me very excited. Using a snifter glass made by Rogness, the very same brewery as this beer, the beer poured a ruby red, crimson color with a finger wide fluffy head. The head quickly dwindled down to a thin layer atop the beer, leaving small and spotty sticky lacing down the glass. The beer started with some chill haze, but had a nice clarity to it after letting it sit for a while, warming up. The aroma of the beer consists of a combination of banana, dark fruits like plum, a hint of a nuts, and a strong ending of booze. For me, this is exactly what a Belgian-Style Strong Ale should smell like. The taste follows the aroma quite nicely. Right up front there are the dark fruit notes, followed by a caramel or toffee body. The flavor of banana comes in at the end, as well as a nutty flavor. There is a strong booze aftertaste, which all works well together. The body is a medium thickness, that has a smooth and oily-like mouthfeel. There was mild carbonation, and a boozy burn at the end of a nice swill. As you can see from my rating of this beer, it is damn near perfect. Rogness really did a great job on this beer. I will more than likely be buying another bottle soon, so I can age it a while and see what that will do to this beer. Metal Connection: Even though the brewery is located in Pflugerville, TX, this is very near to Austin, so I chose a band who was from the Austin area to be paired with this beer. At one point the band, AVERSE SEFIRA was a strong force to be reckoned with, just like a good Strong Ale. I remember seeing Averse Sefira a few times opening up for national tours, and they always put on a great live performance. The last album they released was Advent Parallax on Candlelight records in 2008. Here is a song from that album. I give you “Vomitorium Angelis.” I love the guitar riffs on this song. Definitely one of my favorite tunes that this band put put. Enjoy some Texas Black Metal, and hopefully some good Texas born Belgian-Style Strong Ale!